The ANU Observation Report on the 2017 Papua New Guinea General Elections was officially launched on the 26th March 2019, in the New Lecture Theatre at University of Papua New Guinea. The Registrar, Dr. Alphonse Gelu and three of his staff namely Ms. Madeline Saga, Mr. William Garena and Mr. Solomon Puana attended the launching of the ANU observation report. The Registrar was part of the panel discussions with Dr. Nicole Haley (who is ANU’s Team Leader through the Department of Pacific Affairs), Dr. Joseph Ketan and Ms. Ariana Kassman from Transparency International (TI) PNG to provide comments in responding to the key findings presented by Dr. Haley. The key findings highlighted in the presentation gave an indication that the recent 2017 National General Elections was a failed election due to the fact that the entire electoral process from the voter registration to polling and to counting was compromised by a widespread of electoral fraud, irregularities and election related violence. · Continue establishing separate polling stations in urban areas for people with disabilities; and especially procedures to ensure that they are given priority at all other polling booths. 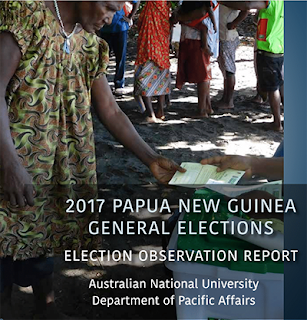 The Registry also launched its 2017 Election Observation Report in 2018 and is available on our website for download. (www.ippcc.gov.pg). Hardcopies can be obtained from the office for a reasonable fee at our office.